Health sciences educators face a continual challenge: how to provide students all the clinical training they need. Health sciences educators face a continual challenge: how to provide students all the clinical training they need. Nursing students, for example, learn the science of nursing mostly in the classroom, but develop practical skills at the bedside, in hospitals and clinics. 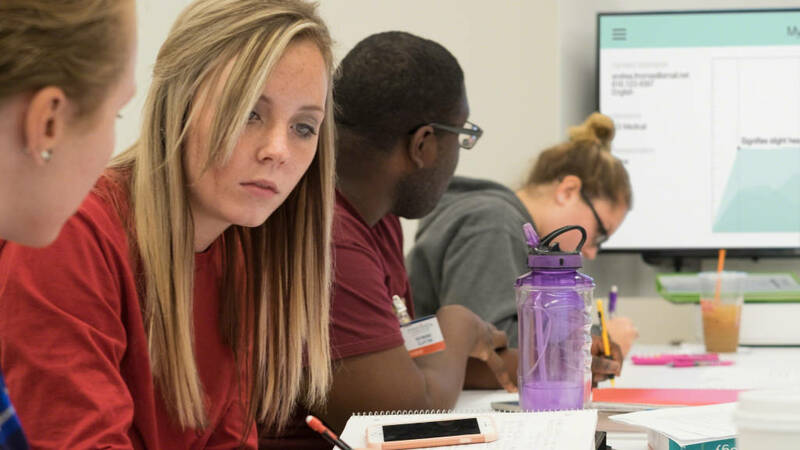 Meanwhile, clinical placements for students are getting harder to find as the demand for healthcare professionals increases —driving the need for even more clinical placements. So, where will students get this critical training? In unique learning environments that combine the elements of both healthcare and education spaces, such as the Center for Excellence in Practice, at the Pennsylvania College of Health Sciences (PA College), Lancaster, PA. The Center is a 20,000 square-foot immersive learning space that replicates a real world treatment facility. 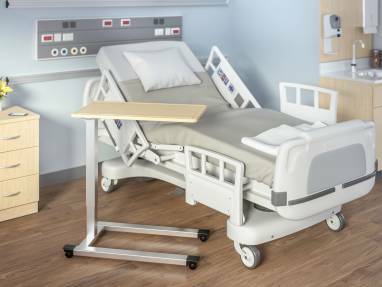 It includes 24 patient rooms and 40 beds, a home care suite, simulation hospital, radiology suite, operating room and other hospital spaces where students can learn essential clinical skills. Students here work closely with patients played by actors, or high tech mannequins that simulate various symptoms and conditions, and a team of clinical and simulation experts. 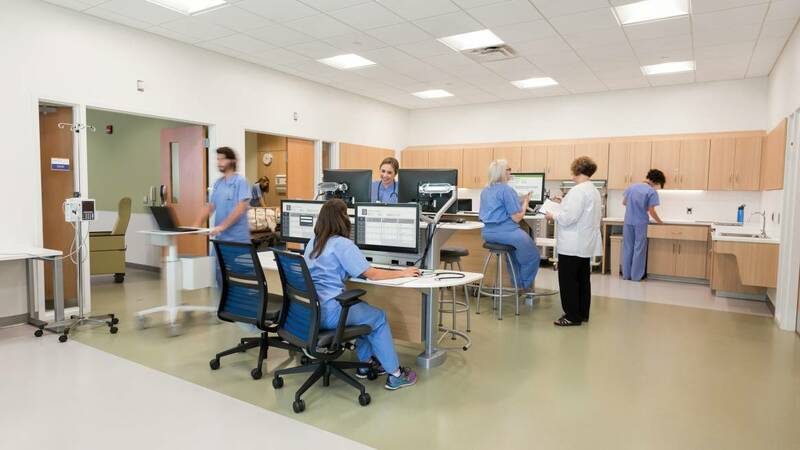 This environment seamlessly integrates furniture and technology so students learn to provide connected care, a more collaborative and effective health experience for both patients and healthcare providers. The Center is a 20,000 square-foot immersive learning space that replicates a real world treatment facility. 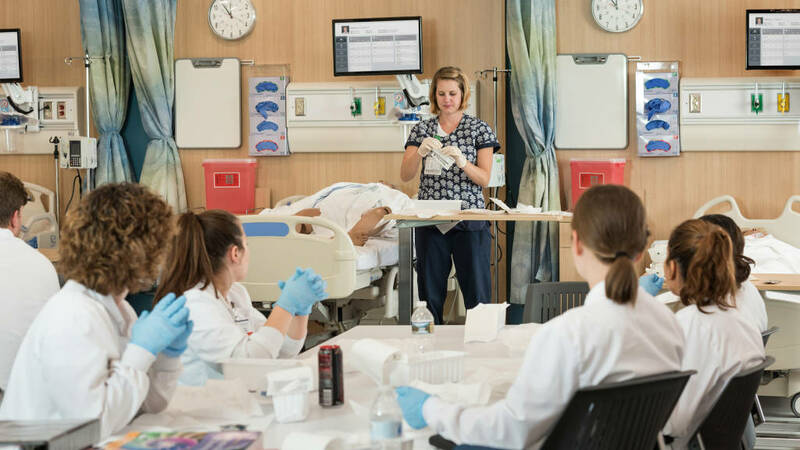 Students here work closely with patients played by actors, or high tech mannequins that simulate various symptoms and conditions, and a team of clinical and simulation experts. How effective is simulation training? 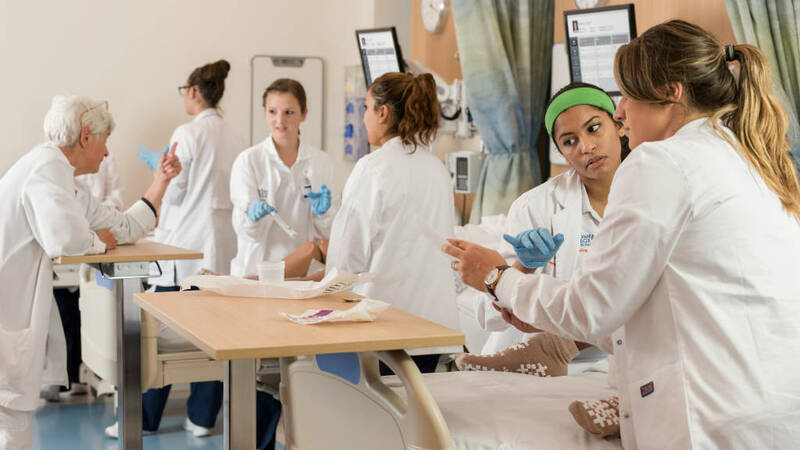 A three-year study by the National Council of State Boards of Nursing with ten nursing schools across the United States , including PA College, showed that students who received up to 50 percent of clinical skills learning in a simulation lab performed equally as well in their jobs as those who received 90% of clinical skills learning in a hospital or clinic setting. The results, measured by grades, board exams and job performance, demonstrate that simulation training has an important role in clinical education. Simulation learning offers unique benefits, too. “It allows you to set each scenario to specific learning objectives and plan the experience. The students can go through it and then go back over it as a team, review what happened and how they can do it better,” says Penni Longenecker, vice president of academic affairs. 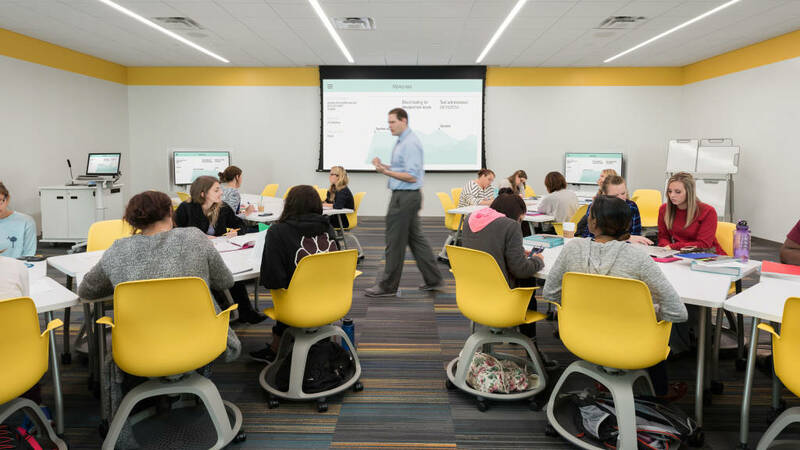 Another advantage of the Center for Excellence in Practice stems from seamlessly integrated furniture and equipment that helps focus learning. For example, the patient room headwalls were originally planned to be millwork mounted in the drywall. The school switched to Opus headwalls from Steelcase Health not only to ensure flexibility to change the space as needed, but also to provide functional and aesthetic consistency that supports the learning process. When students can concentrate on the skill they’re learning with less distraction from the environment, “they can transition quickly from a learning moment to a performing moment. It helps them learn to perform, to hone their skills and become competent and confident,” says Corvino. A significant portion of clinical skills learning, according to both the National Council study and experienced educators, develops after skills practice, in discussions between peers and faculty. That’s why there are five debrief rooms in the Center, as well as many other collaboration spaces across campus. “Every space on this campus is a learning space. It’s a concept we have embraced for some time,” says Mary Grace Simcox, PA College president and a longtime nurse and nursing educator. “I met Steelcase consultants at a conference years ago, and they had a forward-thinking perspective on how every space on campus can support learning. We never lost sight of that. Enclosed spaces, such as group study rooms, have glass walls “so you’re visually connected with the rest of the space. Students can see others learning and be seen learning,” says Deborah Knast, associate at Stantec Architecture. Campus spaces are shared, not owned, by departments. Settings are flexible so they can support practically any subject or pedagogy. 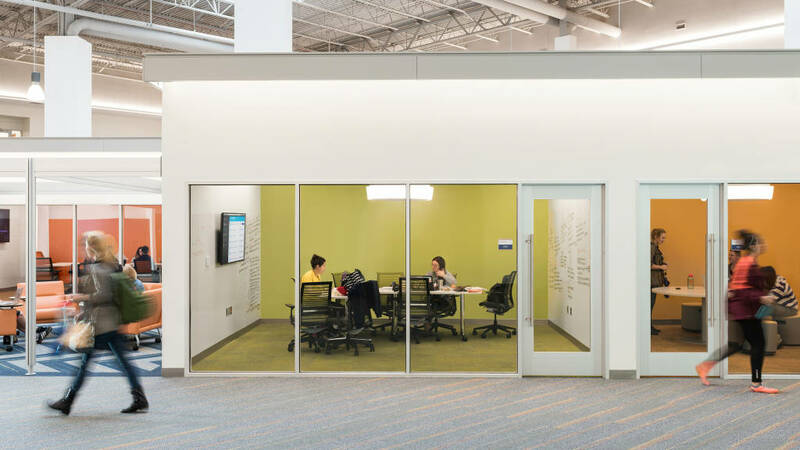 Enclosed spaces, such as group study rooms, have glass walls “so you’re visually connected with the rest of the space. Students can see others learning and be seen learning,” says Deborah Knast, associate at Stantec Architecture. Collaboration requires movement, so “98 percent of what we put in our campus learning environments is on wheels— tables, chairs, pocket carts. Everything is mobile. In three to five minutes you can completely reconfigure a space to whatever your heart desires for that day,” says facilities director Scott Lokey. LearnLab environments integrate media:scape collaboration technology around a worksurface, with mobile seating, whiteboards and three different projection screens at precisely triangulated locations. Combined with a unique “X” room configuration, LearnLabs offer every student clear sight lines, so digital and analog content can be shared from any location in the room. LearnLab environments offer every student clear sight lines, so digital and analog content can be shared from any location in the room. The campus itself, with five old buildings, some as much as two miles apart, was the problem. Students had to park offsite and ride a shuttle three miles to get to class. With no cafeteria or common space where students could gather and socialize and few places for individual or group study, students practically fled the campus after class. The new campus changes everything. Two buildings (former industrial facilities, gutted and rebuilt) are linked by a glass corridor: one houses admissions, counseling, staff offices, dining facilities and more, while the other has 28 classrooms, an auditorium, labs, and the Center for Excellence in Practice. Befitting a college for healthcare students, PA College also fosters a sense of wellbeing with a fitness and wellness center, a rejuvenation center offering places for quiet reflection and relaxation and a medical suite with on-site medical staff. The campus feels both open and connected. “The old way of teaching in a closed space, with students in rows, sitting through a lecture— that’s a very isolated way of learning. When every space is a learning space, there’s more transparency. You can build on each other’s energy,” says Longenecker. The new campus incorporates Brody WorkLounge which provides students with shelter from visual distractions so they can focus their attention, get into flow and get work done. 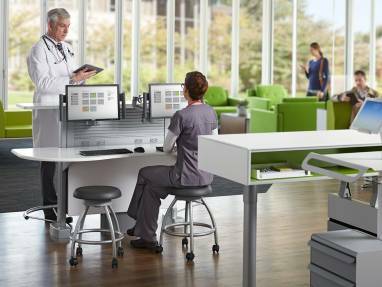 Integrating education and healthcare spaces is key. “Throughout the design process, the Steelcase team listened, provided valuable input and expertise and developed high quality renderings and applications that aligned with the mission of the College,” says Corvino, director of simulation and learning.